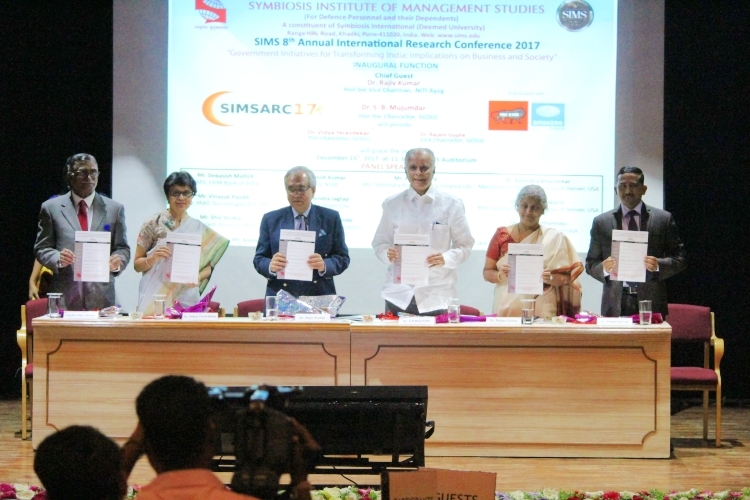 Symbiosis Institute of Management Studies (SIMS), Pune, organizes its Annual International Research Conference, SIMSARC, with a view to provide an opportunity to researchers and scholars alike to participate, present or publish their research papers. 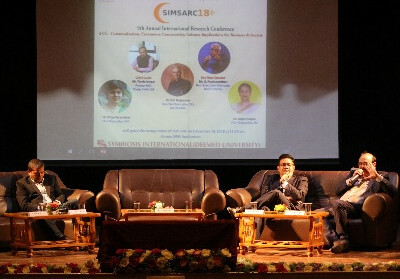 This year too, as part of the Faculty of Management of Symbiosis International (Deemed University), SIMS takes immense pleasure in announcing its 10th Annual International Research Conference, SIMSARC’19 on 16-18 December, 2019. 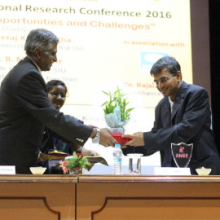 The conference will provide a platform to the researchers to share their research ideas with academia and industry. It will also give an opportunity to meet domain experts and other scholars to create a broad network with participants from various institutes across globe. Futurology: Managing Business in the Age of Technological Disruptions"
Technological developments have drastically changed the way in which business were managed. It is helping businesses to ensure transparency, efficiency and better governance. With constant evolution happening in technology, businesses are gearing up to adapt to the increasing demand for innovative techniques. However, the fast-paced advancement in technology is resulting into the entry of new and innovative technologies which often tend to disrupt the already existing market. It is therefore the need of the hour for the businesses to sustain themselves in a way where they embrace innovation and make the most out of it, without posing a threat to survival. 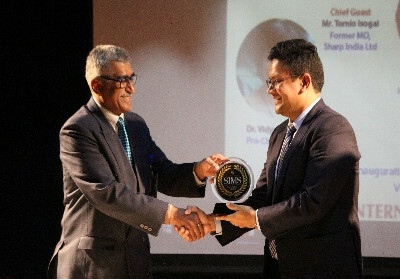 "CFA Institute Research Paper Award"
"Fintech: Future of BFSI Sector"
The conference provides a platform to MBA students to recognize and reward high quality summer internship project. The students who are chosen for this will be given monetary award along with a certificate of appreciation. This is an open competition to all the students of MBA or equivalent those who have done their summer internship as part of their curriculum. It will also provide an opportunity to the students to interact with other students along with the industry experts. Students need to submit a declaration duly signed by head/principal/director of the institute ….. There are 3 prizes of Rs. 7,000, Rs. 5,000 and Rs. 3,000 as 1st and 2nd and 3rd. SIMSARC’19 is looking for sponsorship to promote research among researchers, doctoral students, student’s pursuing their PG degree to present their research on this platform. The sponsorship can be given in the following form. Goodies such Note pad, Pen, Gift to Speakers, Pen drive, Diary etc. Compendium, certificate, banner, conference kit etc. 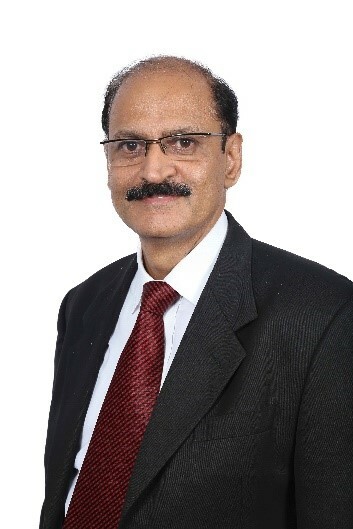 3 Mr. SC Kalia Non-executive & Non Independent Director, Yes Bank Ltd.
Non-executive & Non Independent Director, Yes Bank Ltd.
Summer Internship Project Rs. 1,000/- NA SIMSJMR/ ISBN Book/ Jindyasa. Authors of previous SIMSARC will be getting 10% discount in the registration fee. Beneficiary (Unique) Account No. "01755518198"
Registration fee can be paid either by DD or online payment. 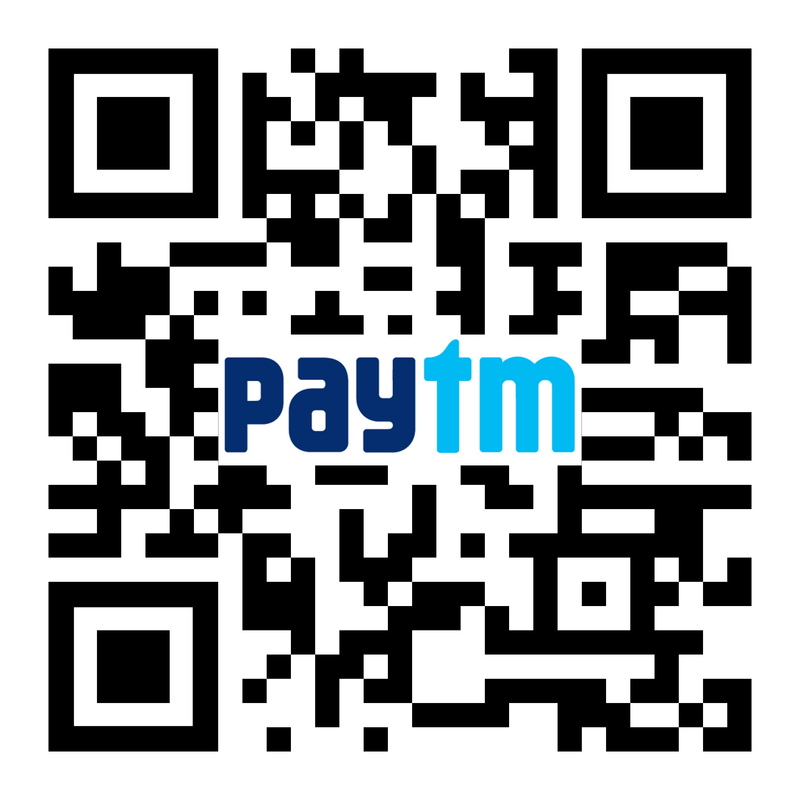 Demand draft should be drawn in favour of 'Director, SIMS' , payable at Pune. If author wants to make payment through Axis Bank, in that case pl send an email to – accounts@sims.edu , keeping email: simsarc@sims.edu in cc and mentioning that author has an account in Axis bank and so wants to pay through Axis bank. Please provide details for IFT ." The research paper should have an abstract of 200-300 words with 3-7 keywords. Names of authors, affiliation, mobile number and email id must be included in the paper. All research papers will be blind reviewed by an external panel of eminent experts. One of the authors must pre-register for the conference within one week after acceptance of the paper to ensure inclusion of the paper in the conference program. Only paper presented will be published. After the payment, applicants are required to mail the screenshot of NEFT/RTGS/DD number of the same at simsarc@sims.edu. Decision would be taken based on review comments, session chair comments, faculty comments, discussant comments, theme, research methodology, overall quality, contribution to the body of knowledge and presentation. Decision of the conference committee would be final. One author can submit maximum two research papers. Students need to submit a declaration duly signed by head/principal/director of the institute (refer to website for the format). |JPSPM- Indexed in SCOPUS and listed as "C" Category journal in ABDC--Conference paper should be re-written/extended by atleast 50% only then, it will be considered for publication. 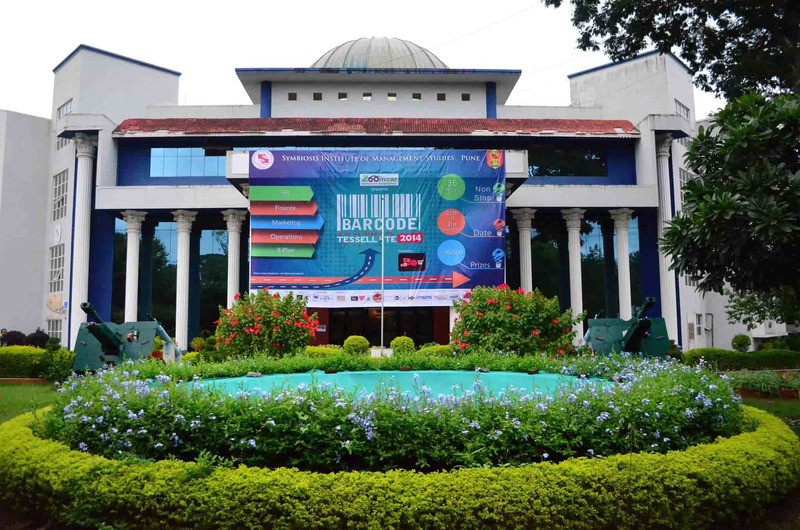 IJTTC- Listed as "C" category journal in ABDC- Conference paper should be re-written/extended by atleast 50% only then, it will be considered for publication. Conference proceeding having ISBN No. SIMS' bi-annual journal, Journal of Applied Management-Jidnyasa, ISSN 0976-0326, indexed in IScholar, JGate and Proquest. Students’ papers will be published in student online research journal 'SIMS Journal of Management Research [SIMSJMR] only. 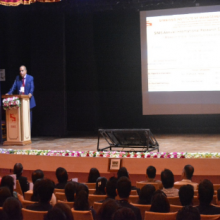 Symbiosis Institute of Management Studies (SIMS), a constituent of Symbiosis International (Deemed University) Pune held its 9th Annual International Research Conference (SIMSARC) from 17th to 19th December 2018 successfully. 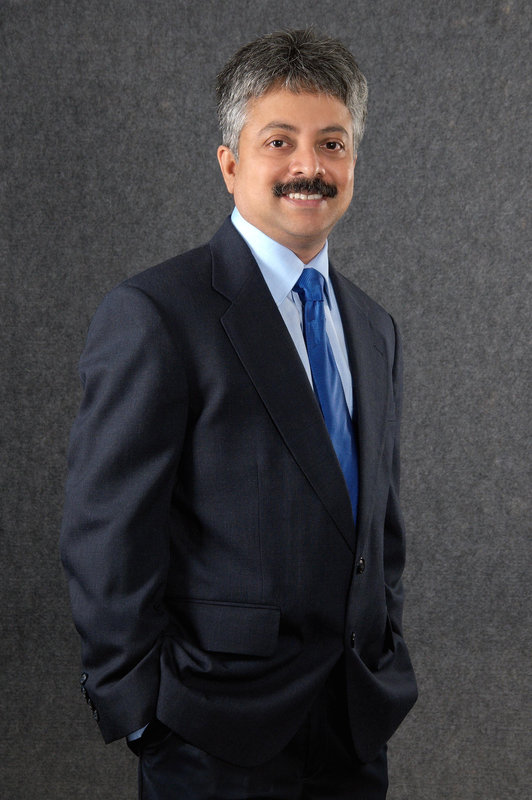 Mr. G. Padmanabhan, Non-Executive Chairman, Bank of India. 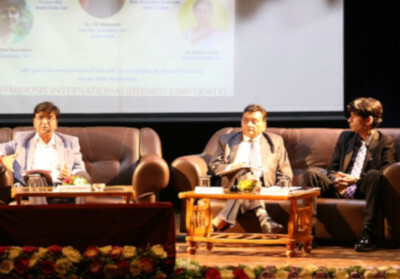 Mr. Tomio Isogai, Former MD, Sharp India Ltd., Dr. S. B. Mujumdar Hon’ble Chancellor, SI(DU); Dr Rajani Gupte Vice Chancellor, SI(DU) were also present on the inaugural function of the conference. Brig. 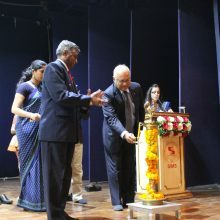 (Dr.) Rajiv Divekar, Director, SIMS was the conference Chairperson and Dr. Arti Chandani, was the Conference Convener. 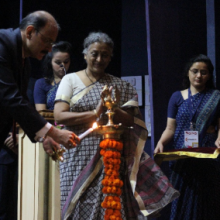 The inaugural ceremony started with all the dignitaries lighting the auspicious lamp. The first speaker to be called on the stage was Dr. Rajani Gupte. In her short and sweet speech, she highlighted the importance of research and how research should be a part of every academic curriculum. She ended her speech by highlighting the importance of the topic in today’s context and importance of culture in today’s corporate world. 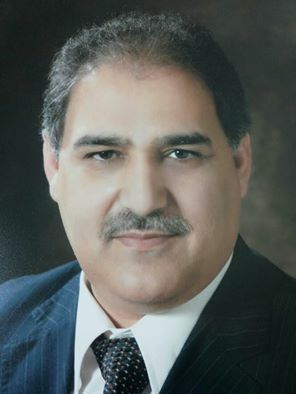 Dr. S.B. 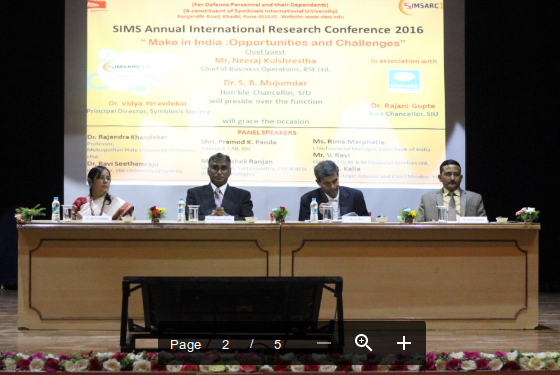 Mujumdar expressed happiness at the fact that the event SIMSARC is being organized in SIMS for 9 years. He talked about how personally he feels that there should be one “I” added to the 4Cs- Innovation. He further spoke about the importance of good research and how good research always leads to productive innovation. 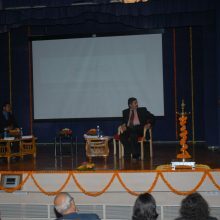 He talked about how there is abundance of research in India but not many platforms to practically apply the research. He felt that there is a need to provide a platform to researchers to practically apply their research and add value to the society. 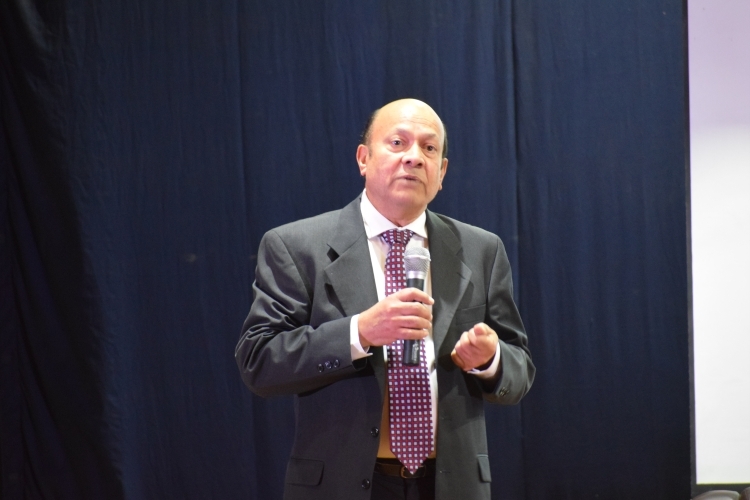 The third speaker was Mr. Tomio Isogai, Former MD, Sharp India Ltd. He started his speech by showing different pictures of Japan and how India and Japan have similarities in their cultures. One of the prominent examples was the picture of the three wise monkeys. He asked the audience the name of the person who made the whole ideology behind the three wise monkeys popular. Among the crowd’s chorus of the name Mahatma Gandhi, he said that Japan had the whole concept 100 years before it came to India. Mr.Tomio further talked about Marketing 4.0, which he explained as the marketing approach that combines online and offline interaction between companies and customers. It blends style with substance. He moved ahead with his speech with a few words highlighting how Japan is moving towards “society 5.0” and how the focus of Japan is towards achieving excellence in STI- Science, Technology and Innovation. His speech concluded with him showing global competitiveness index 2017 in which Japan is in the 9th position and India is in the 40th position. He also showed the global manufacturing competitiveness index 2017, in which Japan is in rank 4 and India is in No.11. He ended his speech on a positive note with the projected ranking for India in 2020 in the global manufacturing index and mentioned that India has a huge potential and capability to reach the first position in the upcoming years. Mr. G. Padmanabhan, Non-executive chairman, Bank of India started his speech by talking about how India is in a very critical point in history. We are becoming digital. As a result, Indian customers are becoming more demanding. At this stage, it is imperative for organizations to pay importance to customer centric innovation. He further talked about new age FINTECH firms and how they are bridging the gap between what customers want and what the FINTECH firms currently offer. They have offered a paradigm shift. The key to success of Indian FINTECH firms is that they are offering products that individual customers want rather than what the masses want. A lot of schemes have come up in India like Jandhan Yojana, Aadhar card, etc. and these are revolutionizing India. There are a lot of challenges which these firms face like lack of trust of customers and absence of regular capital. He further talked about India being the first one to offer immediate payment service (IMPS) and how it has achieved around 400 million transactions, which is a mammoth achievement. 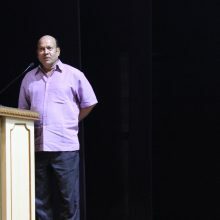 Mr. Padmanabhan encouraged the students to choose their career wisely and create a positive work life balance. The ceremony ended with DR. PRAVIN KUMAR delivering the thank you note. 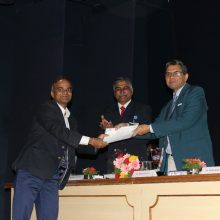 Communication: Role of AI, Big Data and IoT in BusinessesThe ceremony ended with DR. PRAVIN KUMAR delivering the thank you note. The session began with the moderator Dr. M. Thenmozhi, NISM, speaking about application of AI, data sharing in business and society. 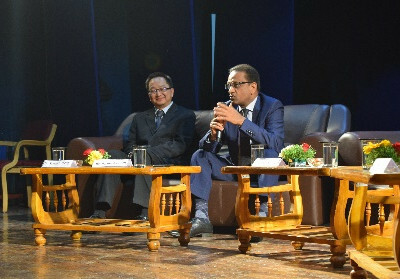 The discussion began with, how communication is changing the business scenario and its future implications, which was directed to Mr. Amrish Goel, DFPCL, to which he responded, that even though the amount of data getting captured and processed is immense we are only seeing the tip of this enormous iceberg. So, a decade into the future communication is bound to run people out of jobs but will create many more than it will consume. Mr. Deepak Bhatia, EXIM Bank, stressed on how IOT is omnipresent, he also spoke about how big data has begun to fill the gap between IoT and AI. He was quoted saying that “now is the time for machine to machine communication which will launch the right product and the right time." Dr. Ravi, Sydney Business School, however expressed his concerns about the ethical implications of these technologies at the societal level. Mr. Molt, Bitcoin co-founder, agreed with Mr. Ravi’s opinion about how these technologies would affect the cohort over 45 years of age specifically voicing his concern over how data collection and AI are not, what we think they are. The panel further progressed to discuss how these technologies are changing the industries. Mr. Deepak who is area specific to banking industry, said that certain risks must be taken into consideration and mused on how IOT enabled processes would eliminate internal finance department. 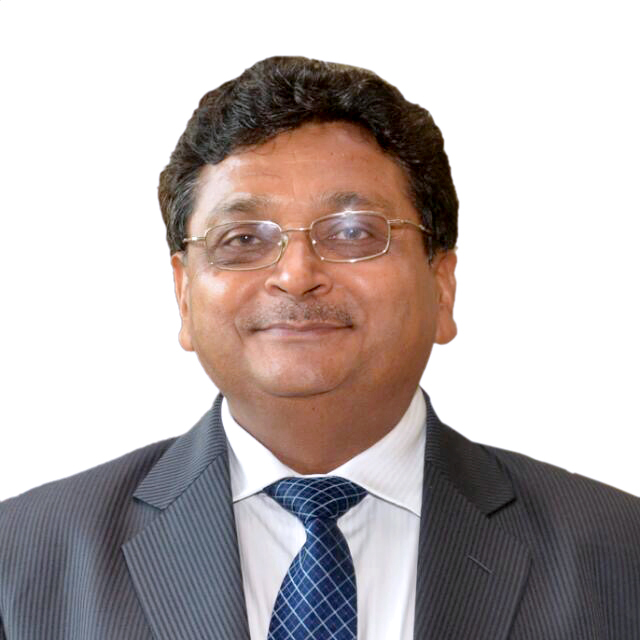 Mr. Amrish goel, with rich experience in manufacturing further added on that manufacturing has been always an exact science with immediate results and a new wave of technology is going to usher in increased efficiency in supply chain management which will be closely linked to customers, bringing down response time and cost. Mr. Molt gave his two cents about Bitcoin and how it creates balance and gives access to money anywhere in the world. The discussion further moved on to address the security concerns raised by such technology to which Dr. Ravi said that as the technology is advancing so are the ways to make the world more secure however, he stressed on the fact it is the misuse of technology that causes all the security concerns. 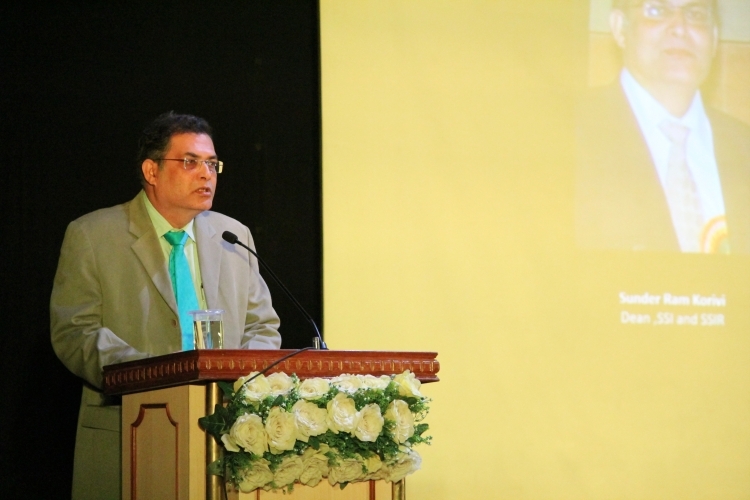 The closing statement was made by Dr. Ravi who emphasized on how a country's government plays an important role in a society beckoning technology friendly. He said how a government views technology will assess how a country refocuses its attention and resources towards development of technology. The discussion concluded on how despite the several concerns posed, big data, AI, machine learning and IoT are inevitable in the long run, if not in the imminent future. It was an extremely engaging discussion which was enjoyed by participants, faculty, and the student managers alike. 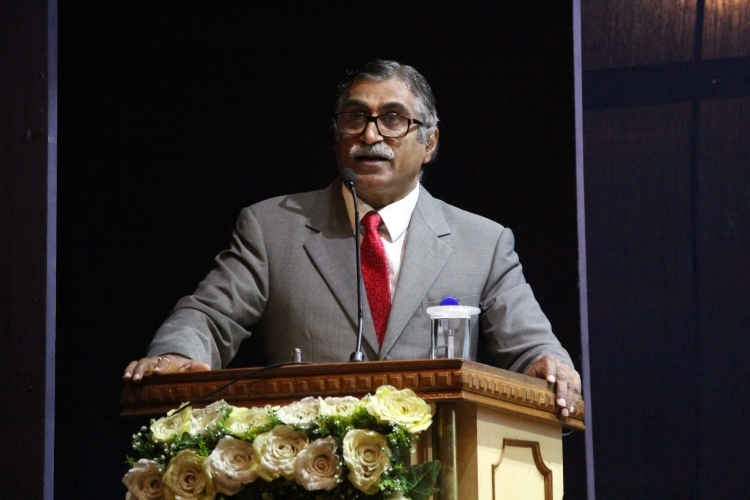 The second plenary session started with Dr. Raj Khandekar, the moderator, setting the background for the whole discussion. He started his speech with the definition of culture. He defined culture as “everything people have, think and behave as members of society.” He talked about how he wonders about a question “what will people find when they excavate our remains in 3018, thousand years from now?” He answered the question in a very thought-provoking way that, these humans will find our ideas and the way we think, when they find our remains thousand years from now. He then mentioned a few examples of the cultural differences our society faces. On the prominent examples was of the attitude of people towards breastfeeding in society. Some societies believe that breastfeeding Is healthy for the baby and breastfeed the baby for more than a year and some societies believe that breastfeeding makes the baby dependent on the milk and thus they avoid breastfeeding them beyond a few months. 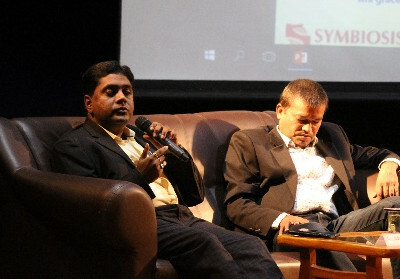 The first part of the discussion was on the different speakers’ cultures. Mr. Tomio talked about Japan’s culture where people have a “we together” attitude and how it is different from Indian culture where people have a “ME FIRST” attitude. Mr. Naresh hilariously highlighted the attitude of Indians wherein we believe ours is a circular world, where “what goes around, comes around”. This attitude plays a huge role in our casual attitude like the fact that going late to meetings is acceptable in India. He also gave a lot of examples highlighting the fact that understanding of a countries culture is important and how not understanding a countries culture has turned out to be disastrous for many organizations. Dr. Kenneth talked about his experience in India. He talked about how he learnt the importance of touching elders feet in India and how elders’ opinion in high regard in India. He hilariously also highlighted how people in India are accustomed to cutting lines. Mr. Naresh carried forward the discussion by highlighting the importance of job titles in India. He hilariously highlighted how job titles like deputy manager create confusion for foreign clients and how it is absolutely necessary for employees in India. The conversation moved on to the German culture where time is of essence and how the whole meeting room fills up sharply at the said time. The discussion was carried forward by Dr. Tomio who enthusiastically highlighted that Japan’s best manufacturing facility combined with India’s “jugaad” would result in best manufacturing facility in the world. The discussion ended on a positive note with students raising their questions on various topics like ways to end language barriers. The panel ended the discussion on the lines of how language barriers will always be there and the solution is to be willing to learn the new language and culture to mitigate these barriers. The session started at around 9:30 AM with the moderator setting a background for the whole discussion. 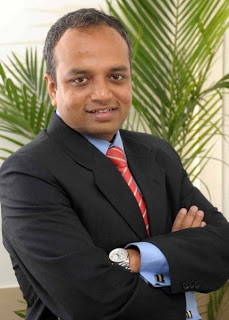 DR. Pawan Jain started the discussion with discussing about how connectivity has gone substantially higher. Social connectivity has increased in the recent decades with apps like Facebook coming up. He took forward the discussion with the question of whether we as human beings are emotionally connected. 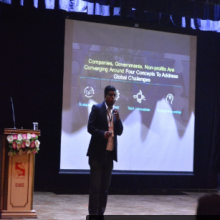 Mr. Anirudh of Emerson technologies discussed on the topic of human to human connection that HR as a field focuses on. This human connection has reduced in the recent days as machines have come between two humans. Even traditional refineries are moving big time on technology, reducing this connection further. 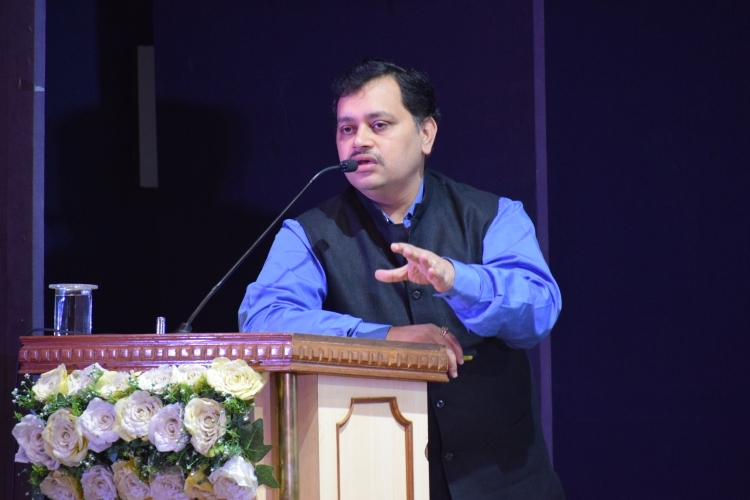 The discussion was taken forward by Mr. Rahul Guha, BCG, who emphasised on the fact that things in the present decade are moving fast and talked about how Bill Gates prediction about future came faster than he predicted. These predictions came true around five years before hand. He further talked about how in the future there will be only two jobs, one where machines tell humans what to do and one in which humans tell machines what to do. As a result, there will be a lot of changes in job profiles in the near future. 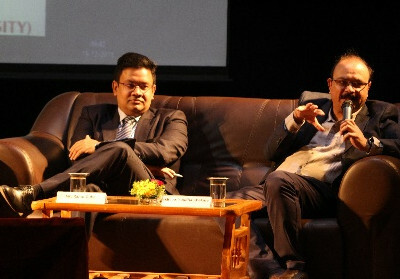 Dr. Aditya took the discussion forward with the discussion about how network connections are important in the present era and how even if new technologies come up the depth of the connection will still remain between two individuals, even though a person is connected with numerous others as well. He further talked about the present generation where everything is automated and how this automation has a lot of negatives like social unrest and unemployment. He emphasised on the fact that technology can improve everything but that should not happen at the cost of replacing human beings. Mr. Rhul Guha took the discussion further by talking about how technology is impacting our everyday lives and how it is simply important to draw a line. Things which are monotonous should be automated but complex things should not be automated. Automation should be done but with certain limits. The discussion ended with a very positive conclusion that this world needs humans and the world cannot be completely replaced by machines. The question of the day still remains that do we need 10000 likes or 10000 people. Robots and automation can be brought in every field but the replacement will only be virtual and real. We cannot always put robots and tell people to ask questions to these machines because at the end of the day the queries cannot always be standard and simple. It is important to develop factors that increase the connection with actual people. The second session began at around 11:30 AM. The session was on “commerce as a fuel for the economy”. 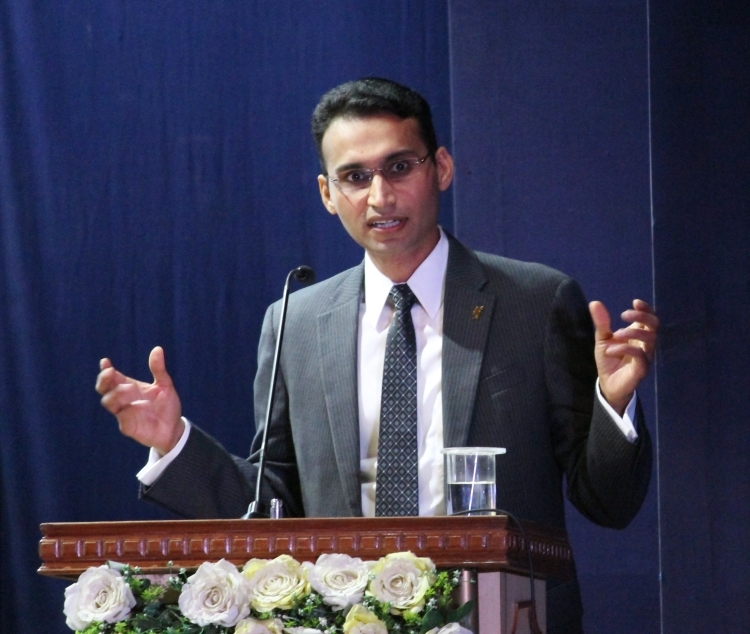 The moderator, Mr. Anuj Ranjan, began with setting the background for the discussion. The discussion began with the moderator talking about how transactions have increased in the recent years and how transactions have become electronic. But there are always challenges like the issue of confidentiality. For example, when we book air tickets, we immediately start getting mails about offers in different flights. This proves how someone constantly tracks our shopping behaviour. The discussion went forward with the topic of dehumanisation and how we are losing connectivity and how interactions are reducing. The discussion then shifted to agriculture in India and the different effects in rural markets. There are 65% of people living in rural markets, but there is a huge disparity in farm holding. The number of farmers are more in China but there is less land available in the country. India as a country has not added much value to agriculture. Farmers sell their produce for a very less rate and as customers we pay a huge price for the same goods. This rate and this scenario is not sustainable. Agriculture is still not seen as a sector in India. 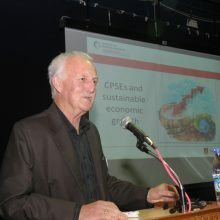 Dr. Dave explained the economic conditions in different countries. He focussed on inclusive growth and how we should work towards reducing inequality which is present across geographies. Mr. Nayan Mehta spoke about the banking system and the various issued being faced by banks in India. The discussion moved forward with the fact that commerce aims at maximum utilization of commodities. For example, banks like SBI and HDFC sell their credit cards in a lot of places like malls which shows maximum utilization of space. The discussion then shifted to SEBI where Mr. Gupta talked about how SEBI has been empowered to take regulations and SEBI takes actions when organizations violates these regulations. SEBI aims at protection of investors of security market and development of security market. It is imperative for SEBI to educate investors about the financial market, cheating by various entities and the presence of misinformation in the society. The discussion ended on a positive note with the fact that India is on the verge of becoming a big efficient sustainable economy and bridging the gap between skills and the jobs available is imperative for India’s growth as a major economy. The session began at around 4 pm. The director of SIMS, Brig. (Dr.) Rajiv Divekar talked about how SIMSARC, initially did not bring on stringent measures and all papers were accepted. After years, SIMSARC has become stringent as they are now being published in top class journals. 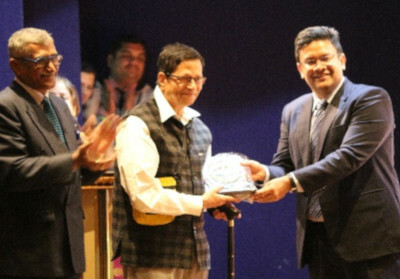 He as the director of SIMS expressed immense pride in the whole show and hoped that the event will be remembered by the people for days together. 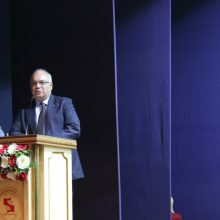 Mr. Rahul, President, BCG, the chief guest talked about the thread that connects the 4Cs- leadership. It is what that integrates the 4Cs. He further talked a few words about commerce and how commerce drives our present world. He further talked about connectivity. He talked about how we are very well connected in this present era. He hilariously mentioned how he as the speaker has to prepare the speech thinking about the possibility that this speech might go on Youtube. He reiterated his words that in the future there will be only two kinds of jobs, where machines tell people what to do and where people tell machines what to do. He concluded with the words that as students we have to make sure that we pick the highest value adding job and not the highest paying job. 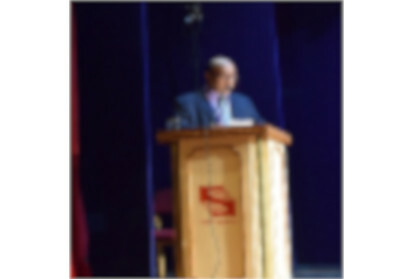 He advised students to make sure that they are connected to the 300 plus people around them and they will prove to be a great advantage in life as they are one of the most important connections in life. The session ended with the prize distribution to the researchers who were evaluated on different parameters such as quality, depth, research methodology etc. Dr. Arti Chandani, Conference convenor, delivered vote of thanks and she thanked one and all who were directly and indirectly involved in making this conference a successful one. 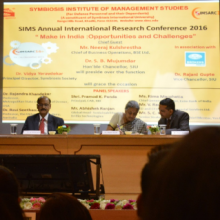 Symbiosis Institute of Management Studies (SIMS), a constituent of Symbiosis International (Deemed University) Pune held its 8th Annual International Research Conference (SIMSARC) from 14th to 16th December 2017 successfully. The theme for SIMSARC 2017 is “Government Initiatives for Transforming India: Implications on Business and Society”. 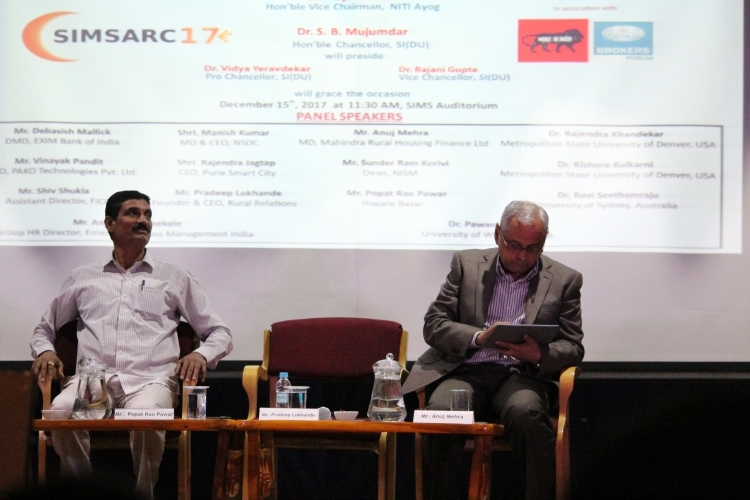 Dr. Rajiv Kumar, Hon’ble Vice Chairman, NITI Ayog was the Chief Guest for the inaugural function on 15th December. 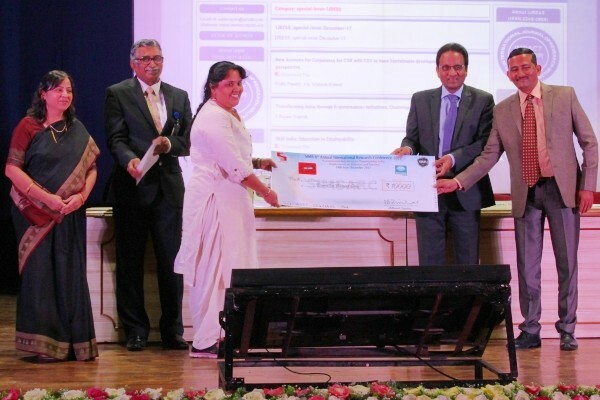 Dr. S. B. Mujumdar Hon’ble Chancellor, SI(DU); Dr. Vidya Yeravdekar Pro Chancellor, SI(DU); Dr Rajani Gupte Vice Chancellor, SI(DU) were also present on the occasion. Brig. 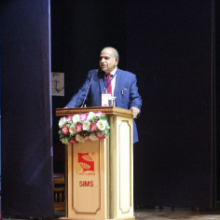 (Dr.) Rajiv Divekar, Director, SIMS was the conference Chairperson and Dr. Arti Chandani, was the Conference Convener. 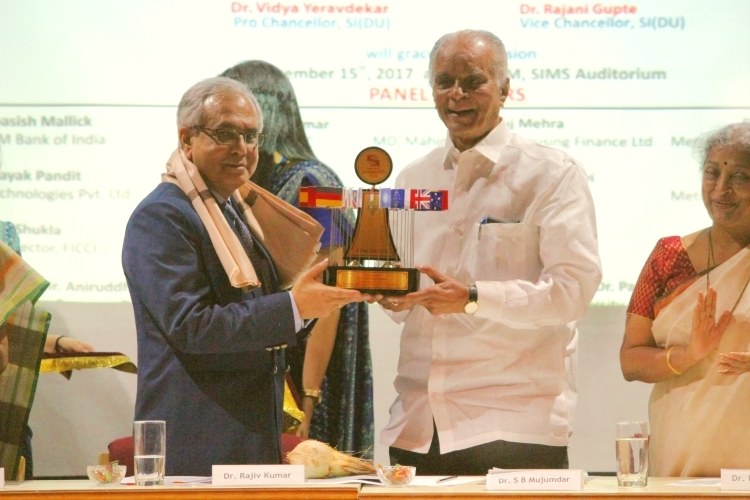 Rajiv Kumar, Hon’ble Vice Chairman, NITI Ayog, the Chief Guest for the inaugural function wished SIMS on its 8th Successful SIMSARC Conference and added that he wishes the young research minds to contribute in transforming India through Govt. Initiatives that can be practically applied. He said Niti Ayog serves as an open action funnel with its mouth opened towards Society that takes suggestions and ideas from the society and includes all relevant ideas into the system. Dr. S. B. Mujumdar Hon’ble Chancellor, Symbiosis International Deemed University presiding the event was very impressed by the topic chosen for the conference and said “If you want to know what Pune thinks tomorrow; you should know what Symbiosis thinks today” The government has launched an array of initiatives which are aimed at making India a better country to live in. 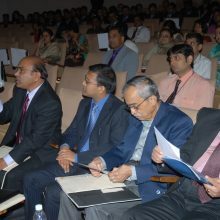 These initiatives are in different fields and the focus of these initiatives is to bring the lower strata of society into the mainstream of India It would also foster the growth and development in the business world in terms of: increase in speed, improve in governance and ease of doing business through various technology and techniques. 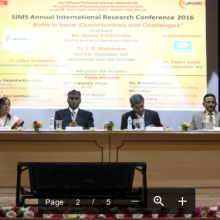 These initiatives present a plethora of opportunities but it comes with a host of challenges and SIMSARC’17 served as the platform where the opportunities, challenges and the solutions to meet these challenges were discussed by the delegates and dignitaries through their research papers publications and case studies. The objective was to provide a special forum to present and discuss management of business under the umbrella of the ‘Government Initiatives for Transforming India’ and to facilitate sharing of multidisciplinary research based knowledge amongst researchers, academicians and students. Over 151 papers were reviewed by the double blind peer review out of which 102 papers were shortlisted and presented over these 2 days of research meeting. The two day deliberations were divided into four sub themes revolving around the central theme of the conference. These sub themes were specially selected as they have maximum impact on business and society namely: Energy & Environment, Rural India: Prospects and Challenges, Sustainable Infrastructure: Impetus for Growth, Capacity Building: the Future is Now. To give a holistic perspective on each of these subthemes an array of experts from Industry, Govt. 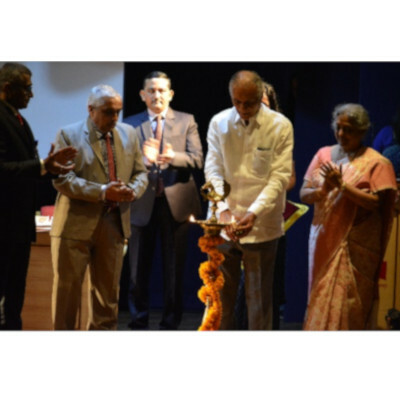 , Society and academics such as Dr. Rajiv Kumar, Hon’ble Vice Chairman, NITI Ayog, Mr. Debasish Mallick, DMD, EXIM bank, Dr. Kishore Kulkarni, Metropolitan State university of Denever, USA, Dr. Rajendra Khandekar, Metropolitan State university of Denever, USA, Dr. Ravi Seethamraju, University of Sydney, Australia, Mr. Popat Rao Pawar, Hiware Bazar, Shri Rajendra Jagtap, CEO, Pune Smart City, Mr. Pradeep Lokhande, Founder & CEO, Rural Relations, Shiv Kumar Shukla, Assistant Director, FICCI, shared their knowledge and experience. Business Environment and Rural India : Prospects and Challenges. 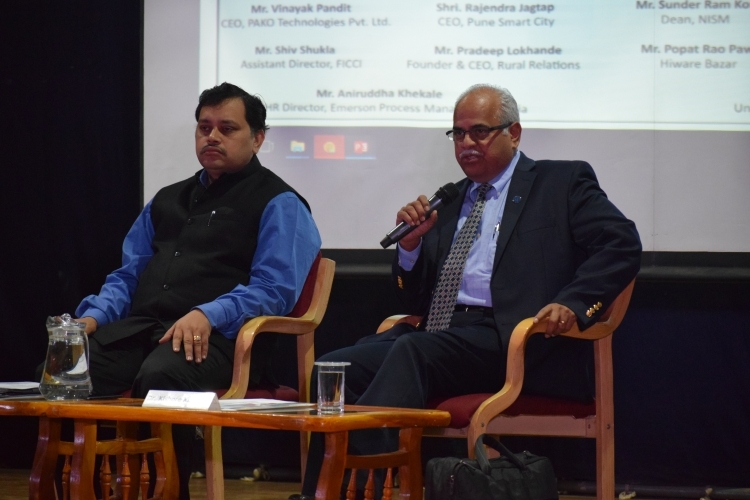 Dr.Ravi Seethamraju, University of Sydney, Australia and Mr. Sunder Ram Korivi, Dean, SSE & SSIR, NISM and Mr Debashsish Mallick, DMD, EXIM Bank of India shared their Insights on Business Environment. 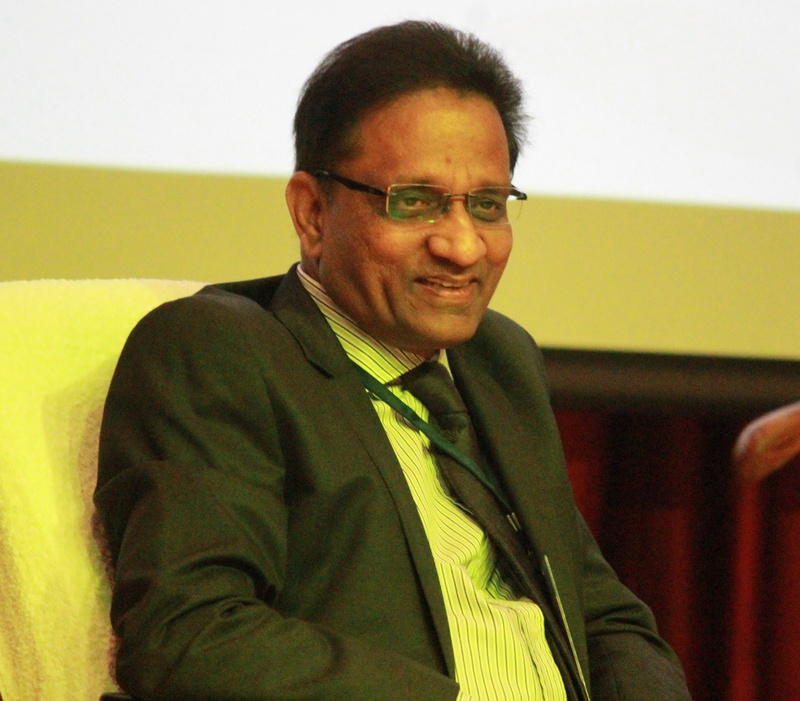 Dr. Seethamraju talked on Metadata and long term strategic plan and Attention Economy. He said that the future holds new opportunities and challenges. He gave an example of Google self-Driving Car and said that we can imagine the kind of impact it would have on Urban designing of the cities, roads, Infrastructure, Malls and not just Automobile Industry.He further talked about Attention Economy that’s going to be the Future Most Expensive Economic Asset. Everyone in the business would seek attention in order to deliver the services. Large piles of online database demands attention and so on and that’s how there’s a huge market. Dr. Korivi delivered his talks on Hydraulic tracking. He drew everyone’s attention to the war that’s going on Geo Politically between nations like America, China, Russia and the Arab Countries on manipulation of the petrol prices He talked on oil companies using an Opaque policy to their own advantage. Then he took the attention of audience on the Balance of Power that finally where the BOP would lie in probably a Battery operated car so the dynamics would entirely change. Dr.Mallik talked on technology, Environment and Utilization of resources especially to generate energy. He talked about clean energy giving an example of how clean hydraulic energy is but it could not gain popularity due to the instability and dependability on water and rain. He also talked on Input- output matrix of more stable energies like thermal and Coal. He said that initially Energy and Environment was essentially a challenge especially to generate clean energy. He added that it is imperative to use Clean Energy and with the kind of scientific achievements in this era it is possible now. We should further allow technology and market to drive it for further reduction in cost and should not go for bidding for deciding the cost on these energies so as to protect the environment. 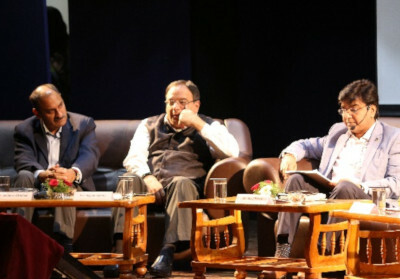 The Moderator for the discussion was Mr. Anuj Mehra, MD, Mahindra Rural Housing Finance Ltd , and Mr. Popat Rao Pawar, Hiware Bazar and Mr. Pradeep Lokhande, Founder & CEO, Rural Relations were the Panel Speakers. Mr. Anuj Mehra talked about the need for giving home loans and ability to reach the lower strata of society so that they can also afford homes. He also talked about the fact that how rural India is a huge upcoming and potential market. Mr. Popatrao pawar talked about how he transformed Hiware Bazar from a village which was suffering from lack of water resources to a green and prosperous model village with highest GDP in the country. The Hiware bazare gram panchayat, with Mr. Pawar as its sarpanch, won the first National Award for community led water conservation in 2007. Mr. Pradeep Lokhande talked about Rural relations- how to reach out to rural India and contribute to its development. he talked about how he has been able to do all that in his 20 years of association with this mission.He has personally visited over 4,000 villages in India, recorded their population, markets, education systems, consumer habits, etc. He has installed used computers in rural secondary schools, where the interest and curiosity of the students was very high, etc. 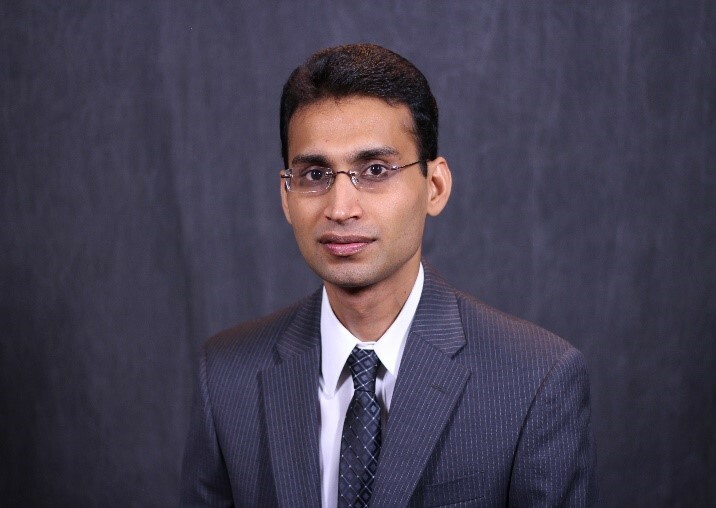 By Mr. Rajendra Jagtap, CEO, Pune Smart City and Dr. Kishore Kulkarni, Metropolitan State University of Denver, USA. was seen moderating the discussion. 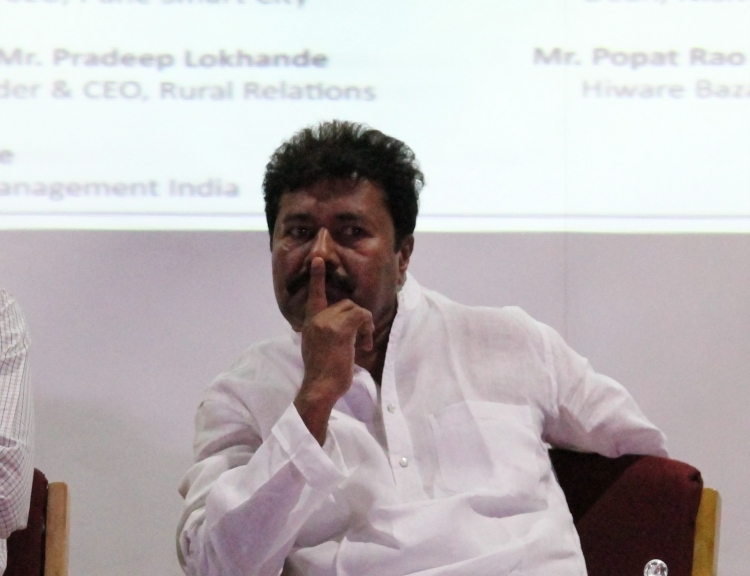 Mr. Rajendra Jagtap extensively talked about the Smart city project handled by him for Pune city. He said that an Investment of Rs.70000 crores is projected for Infrastructure Development alone. They expect the project delivery to get completed by 2030 especially for Urban Areas that includes Sewage, Mass transport, water, Solid waste, Open Green Space, storm water. They aspire to ensure future proof way of Infrastructure development. They have already accomplished Command and control by installing CCTV, WIFI, Environment sensors, Flood Sensors etc. He added that the sustainable environment features are built in and so the assets that are being created will have sustainability and proper usability in future as well. He said that the project involves inputs from the end users keeping in mind that ultimately they are the ones who are to use so the loopholes and gaps are being covered real time. ‘Capacity building: The future is now’. 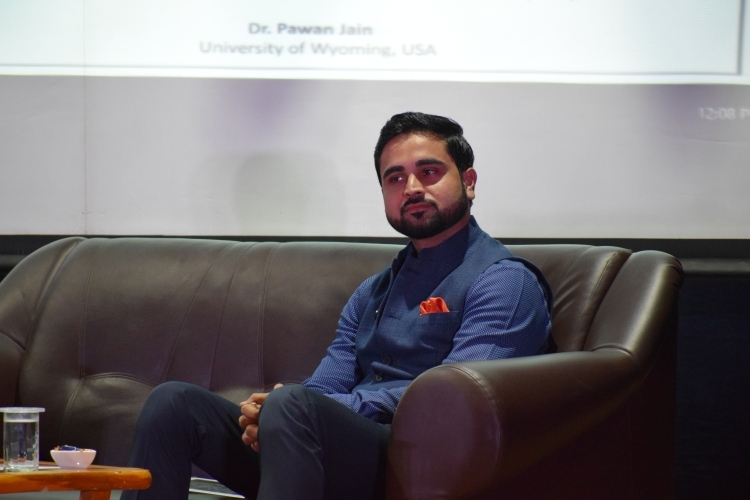 Dr. Jain highlighted the Importance of Collaboration and he said there are enough resources all around if you stop being competitive and collaborate in order to have powerful research. He said Time horizons are getting shorter in the competitive world and you need to build up speed to reach your target so Collaboration is the key. He said we are still looking at huge Infrastructure that is Capacity and in order to be creative you need to build capacity. 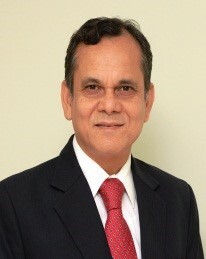 Dr. Shukla added that India needs to build huge capacity. He talked about Reskilling, Deskilling, Upskilling yourself. He said factors like media literacy, Intermigration, Job demand are going to change future course of hiring from B School. He talked about Mind mapping and said that students need to develop on their soft skills in order to get into a particular field in future. For all this, we need to be a good researcher and understand the changing dynamics. He talked about E commerce and digitalisation and said in all this one needs to be responsive, creative and collaborative. The conference was further addressed on the topics : Seven questions of leaders, IT/S in Manufacturing SMEs (Small and medium sized Enterprises) – Opportunities & Challenges, Make in India: Impact on BFSI and Financial Inclusion and SME Financing by eminent speakers like Dr. Rajendra P. Khandekar, Professor, Metropolitan State University of Denver (USA) and Dr. Ravi Seethamraju, The University of Sydney Business School, Australia, Mr. S.C. Kalia, Senior Strategic Advisor and Chief Mentor, Yes Bank Ltd., Shri Pramod K Panda, Principal, College of Agriculture Banking, RBI and Mr. Abhishek Ranjan, Global head- Sustainability, CSR and BFSI Industry marketing, Brillio Technologies and Ms. Rima Marphatia, Chief General Manager, Exim Bank of India. The conference got huge success where in 120 papers were received in total which were shortlisted to 80 papers after double blind peer review process. 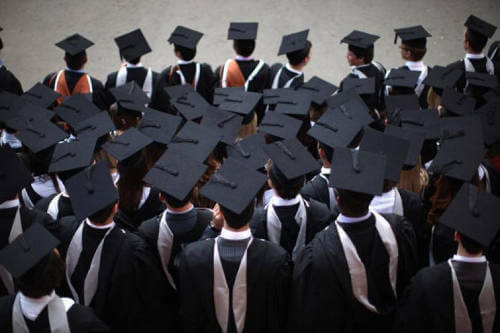 These research papers presented were far ranging in their categories, papers of all the practicable specializations, be it Make in India, Marketing, Finance, Human Resources, CSR, General Management or Operations. 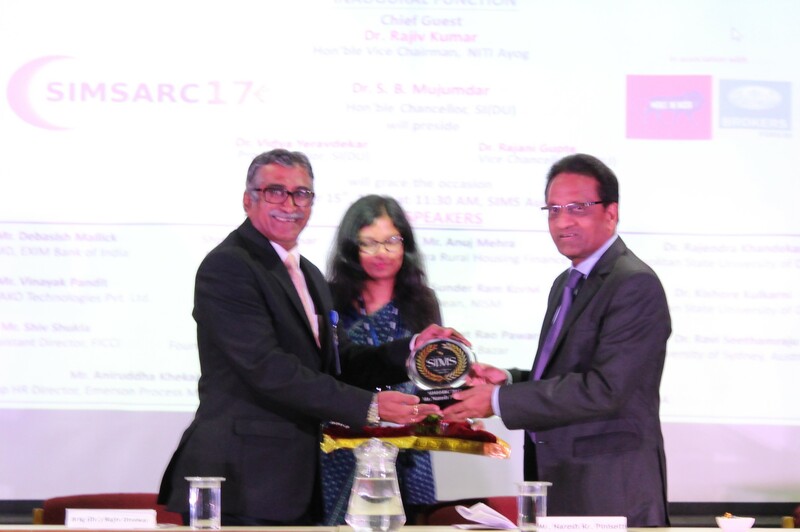 SIMSARC’16 was ennobled by a large number of participants from a multitude of locations from around the country. 5 best quality papers are already published in the SCOPUS indexed journal, Indian Journal of Science and Technology (INDJST) and 8 papers are published in indexed journal. The remaining papers will be published in the next issue of the journal. 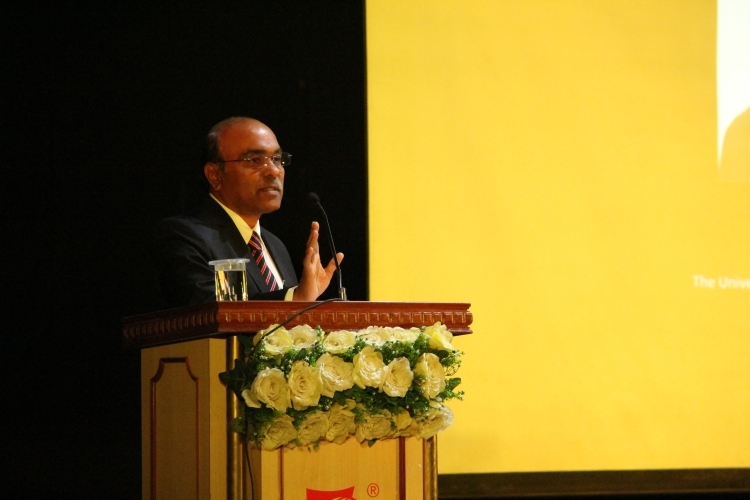 The valedictory address was given by Mr. V Ravi, ED and CFO, Mahindra & Mahindra Financial Services Limited (MMFSL). 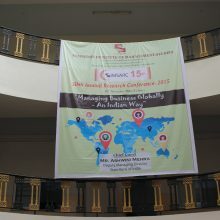 The conference was a much applauded affair with accolades pouring in for its solidarity and singularity from all sides. It was an experience by means of which the researchers and student managers assimilated a lot of critical concepts that undoubtedly added a great value to the already present potential in them. The objective of the conference is to stimulate and encourage research and to motivate the researchers, the 3 best papers were awarded a cash prize of Rs. 10,000, Rs. 5,000 and Rs. 3,000 for 1 st , 2 nd and 3 rd prize respectively. The winners were announced by Dr. Arti Chandani and the chief guest along with director gave away the certificate to the winners. The conference concluded with the vote of thanks delivered by Dr. Pravin Kumar. 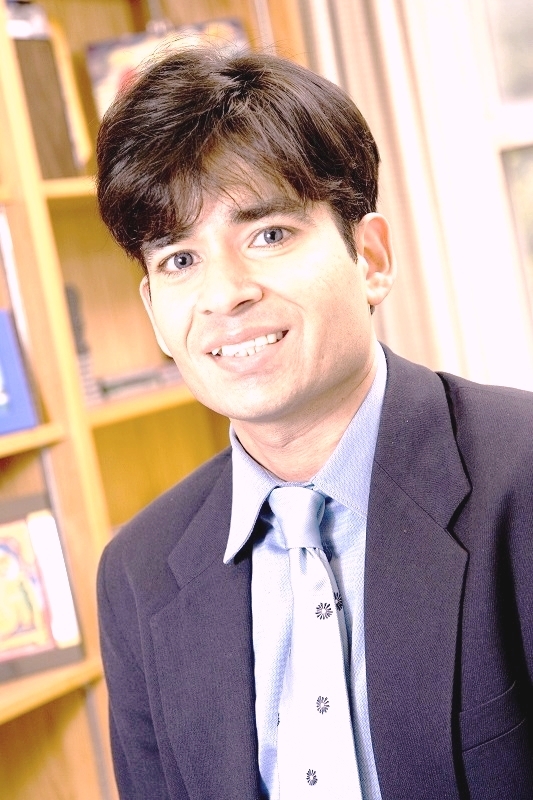 Dr. Kishore G. Kulkarni, Metropolitan State University of Denver, USA. 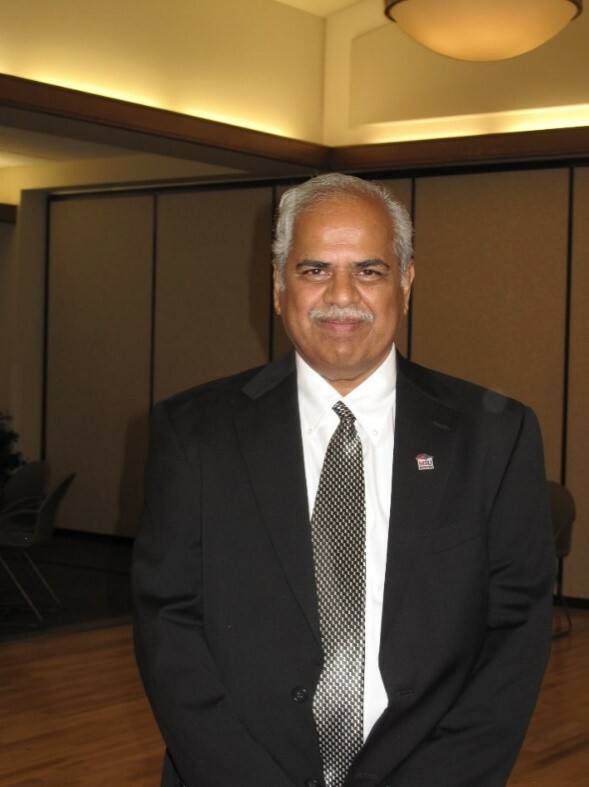 Dr.Rajendra P. Khandekar, Metropolitan State, University of Denver, USA. 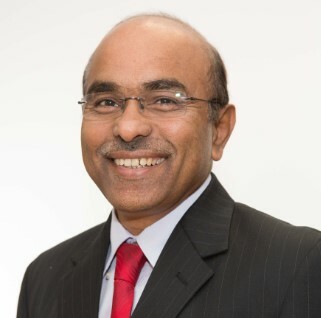 Dr. Ravi Seethamraju, University of Sydney Business School, Australia. MR. Mukesh Kumar, Deputy General Manager, RBI. 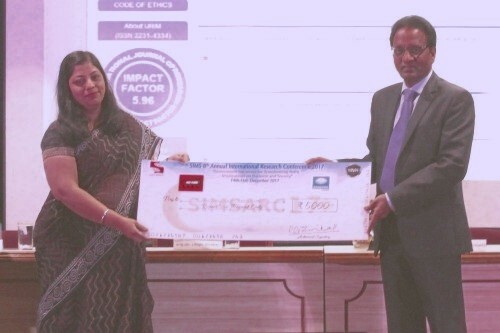 SIMSARC’15 received an overwhelming response wherein 82 papers were received from research scholars from all over the world of which 64 papers were selected after double blind peer review process. The conference commenced with research paper presentations. under marketing, Human Resources, Finance, Operations and General tracks. The ceremony concluded with the prize distribution ceremony where prizes were given to the winners of each track. 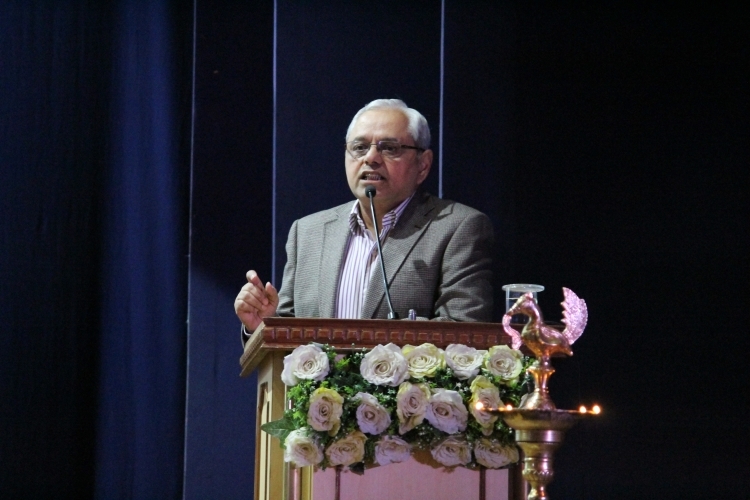 Dr. Pravin Kumar, deputy director pronounced the thank you note to the audience. The conference was a much applauded affair with accolades pouring in for its solidarity and singularity form all sides. All participants were enthralled with the flawless execution of the conference proceedings which ran as if guided by an invisible hand. addressing the august audience. 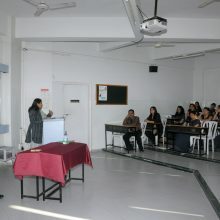 The day was concluded with Research Paper Presentations under HR, Marketing and General Management tracks. 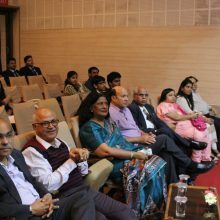 A free Post-Conference Research Workshop was organised for all participants and faculty post lunch on 14 Dec and first half day of 15 Dec 2014, to benefit in understand ‘Research’ in the best interests of competitive business and social harmony as Transformational Leaders. 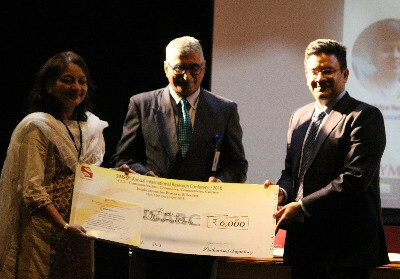 The Theme of SIMSARC’13 was “Shaping the Future of Business and Society”. Mr. Filip Vandenberghe, MD – Atlas Copco. 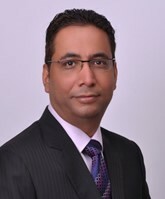 Dr. Mukul Madahar, MBA Welfare Director – Cardiff Metropolitan University (UK). 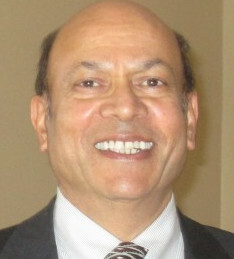 Dr. Rajendra Khandekar, Professor – Management, MSU (Denver). The valedictory address was delivered by Donald Salyards, Professor – Economics, Winona State University followed by Prizes Distribution. 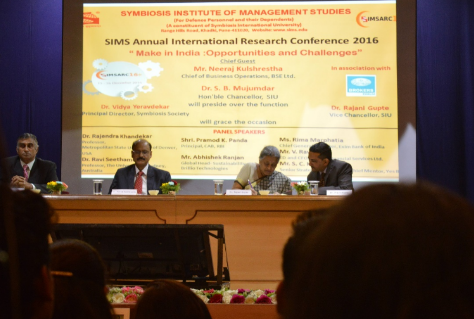 SIMSARC is an annual Research Conference of Symbiosis Institute of Management Studies, Pune. SIMSARC provides an unparalleled opportunity to researchers and scholars to enrich their body of knowledge through their extensive research papers. SIMSARC also offers a platform to the researchers and scholars to share and publish their thoughts and ideas. The seminar officially commenced with the lighting of the lamp followed by the inaugural addresses by Brig. 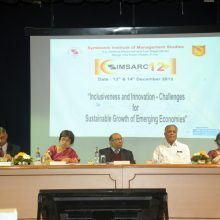 Rajiv Divekar, Director, SIMS; Dr. Vidya Yeravdekar, Acting Vice Chancellor, SIU; Dr. S. B. Mujumdar, Chancellor SIU and Dr. Debasish Chakaraborty, Director MBA Program, Central Michigan University, USA with regard to SIMSARC’s 2012 agenda “Inclusiveness and Innovation – Sustainable Growth Challenges in Emerging Economics”.Day 1 of the Seminar witnessed a plethora of guest speakers impart their views and ideas to the student managers and the highly revered multinational dignitaries. 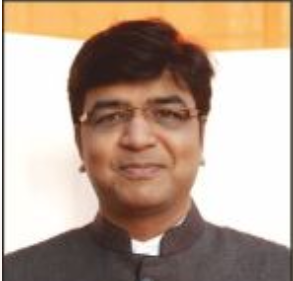 Dr. Mukul Madahar, MBA Welfare Director, Cardiff Metropolitan University, UK discussed the “Inclusivity and Innovation Challenge” with regard to the education sector in India. He noted that private education Universities could be instrumental in shifting the educational paradigm with emphasis on potency of education. 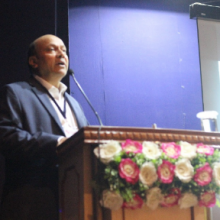 Dr. Booshan P. Kelkar, Country Manager, IBM India, University Relation India addressed the audience on “Innovation and Intellectual Property”, elaborating on the patents procedure in India and the costs, time and the hiccups experienced while acquiring a patent. He presented his insight on how monopoly should lie with the inceptor of the idea and concluded that ‘India 2020’ might be a far-fetched vision for now. 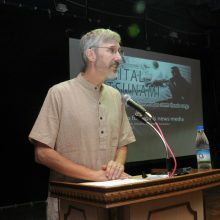 Brian Patrick O’Donoghue, Associate Professor, Department of Journalism, University of Alaska, Alaska USA presented his dialogue on “Digital Tsunami: Implications of India’s News Media Approaching Confrontation with Mobile Information Storms”. 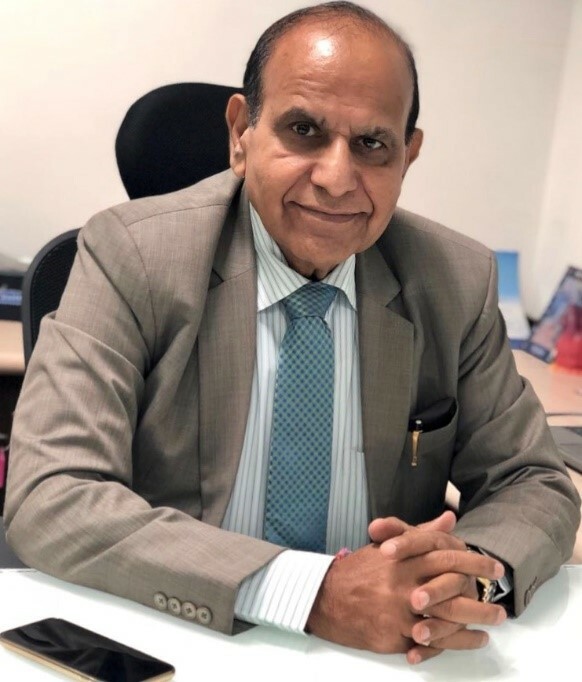 He shed light on the shrinking market share of newspapers in India due to the digital age while the ‘digital tsunami’ in the United States has had only a slight impact on the newspaper’s market share. Prof. Dr. Patthira Phon-ngam, Chairman of Doctoral Degree Program Faculty of Humanities and Social Science Loei Rajabhat University, Thailand spoke on “Innovation for Economic Development”. She stated that the youth of the India are its core strength and the nation is layered with innovative streak. The first day concluded with a Culture Program by the Student Managers of SIMS showcasing vibrant performances by the Music Club – Sur, the Drama Club – Aks and the Dance club – Vibes. 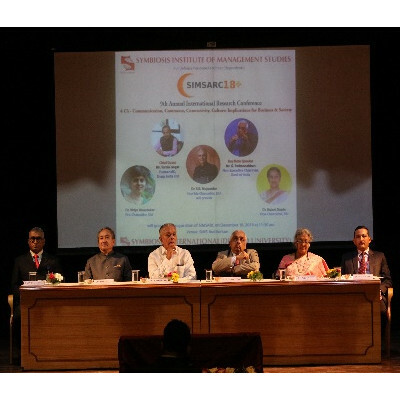 SIMSARC – a knowledge extravaganza reconvened in the true spirit of learning after the success of day one. The day flagged off with an insightful address by Prof. Stuart Locke, Director MBA Program University of Waikato Hamilton, New Zealand, on “Corporate Governance: A Global Perspective” that enriched the audience on the pathway to attain sustainable growth and its additional value to stakeholders. He also identified the advantageous pattern of mixed ownership for public enterprises. 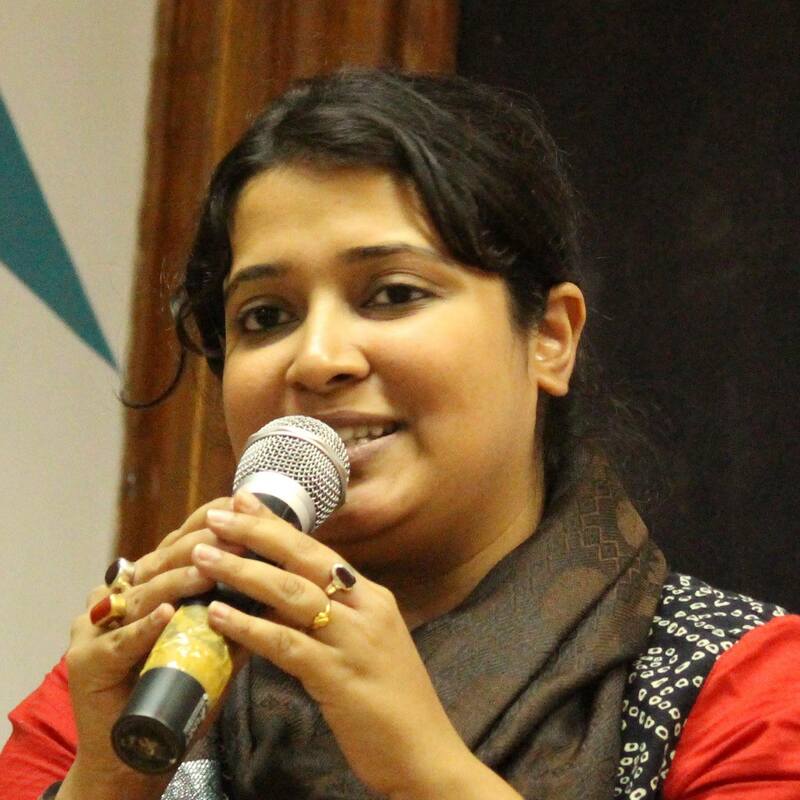 The august gathering was set in motion by Dr. Geeta Rani, Teacher Fellow in Dept. of Finance, University of Waikato Hamilton, New Zealand. She spoke extensively on how Indian corporates have been trying to diversify their talent pool to deliver additional value and how government enterprises should take a cue from this paradigm shift. 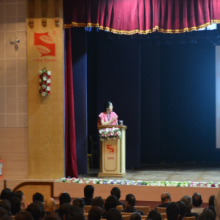 She also emphasized on endeavours to bring in diversity in the corporate boards in order to strive for innovativeness. In order to add to the research seminar, Mrs. Suparna Shankar, Senior Research Scientist, Sustainability Business Unit, Infosys Limited Bangalore offered her dialogue on “Inclusiveness and Innovation-Sustainable Growth Challenges in Emerging Markets and what it means to Business”. She emphasized on the essential attributes of innovation and inclusiveness as the business thrives on the aforementioned two aspects. Her interactive lecture brought forth various examples of the contemporary world adopting the two drivers of sustainable growth. 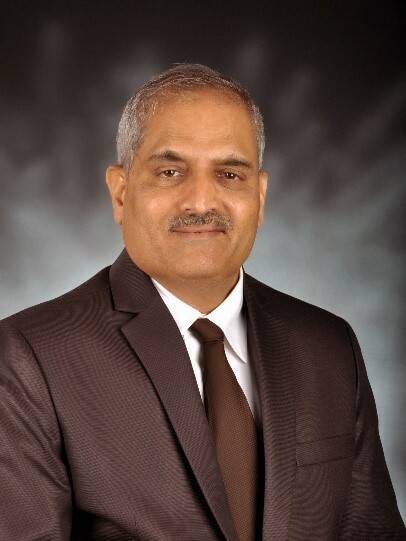 The audience was enthralled by the Valedictorian Address delivered by Raj Khandekar, Ph.D., Professor, Management Department Metropolitan State College of Denver, USA on “Experiencing Diversity Upside Down”. 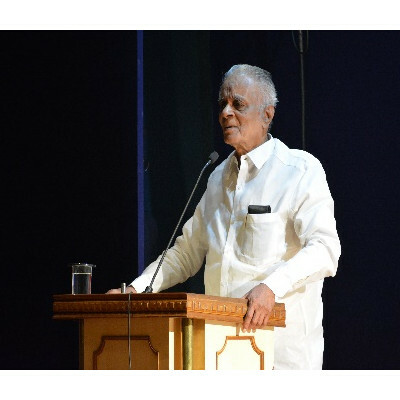 He enlightened the gathering on the importance of an egalitarian culture in the corporate arena. He further elaborated on the humbleness, a prerequisite in the contemporary corporate world. 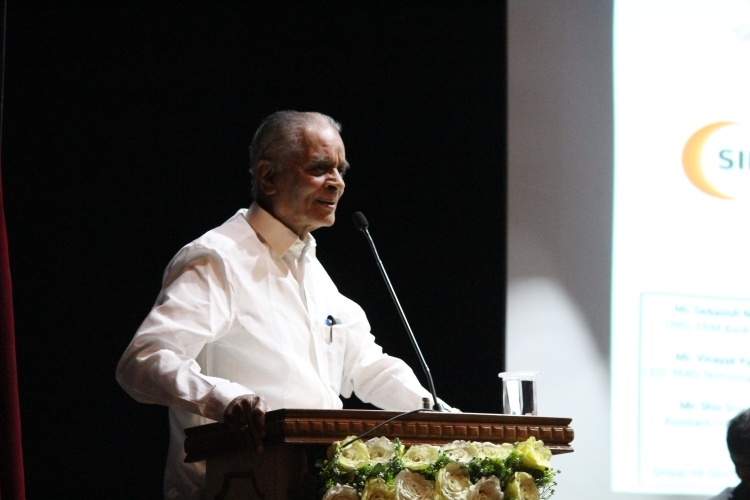 SIMSARC concluded with a vote of thanks by Prof. Dr. B. R. Londhe, Conference Convenor, Professor, SIMS. 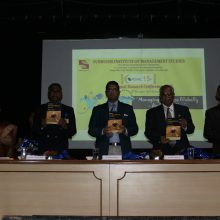 SIMSARC’11 was held on the 15th and 16th of December 2011. 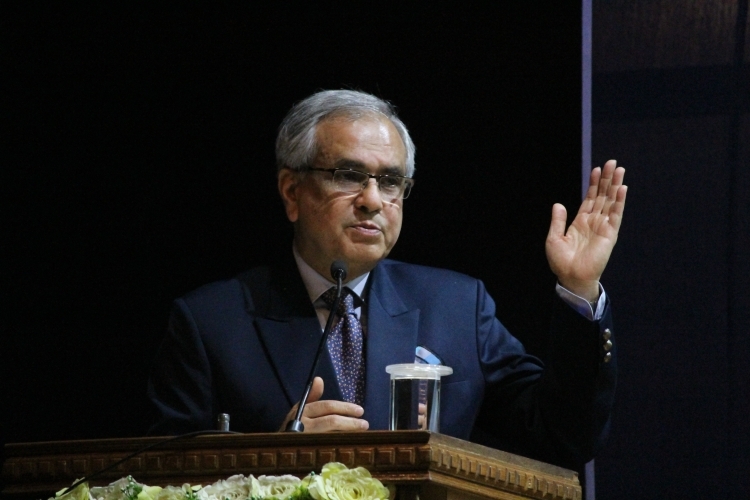 The main theme of the Conference was ‘Big India Breaching Boundaries: India By 2020’. 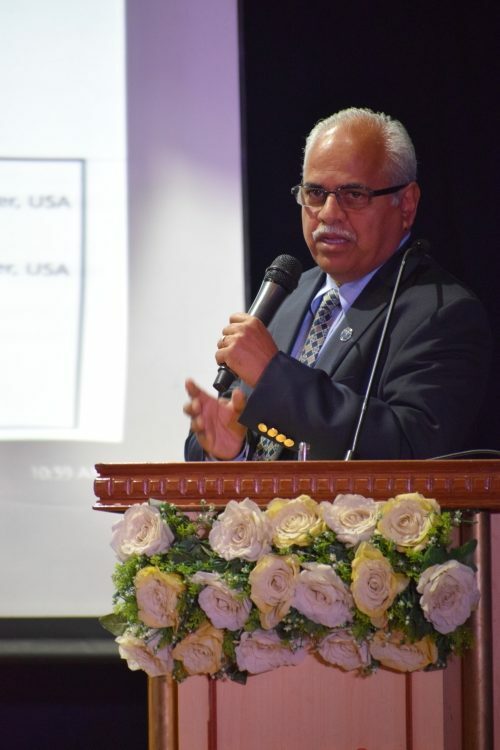 The Conference was inaugurated by Dr. Prafulla Agnihotri Director, Indian Institute of Management, Tiruchirappalli who talked contribution of India in global economy and opportunities and challenges to Indian economy in years to come. 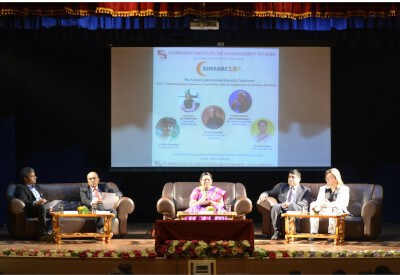 It was then followed by an invigorating discussion on the various aspects of the central theme of the conference by eminent persons like Dr. Subhash Sharma, Director Indus Business Academy, Bangalore, Dr Ravi Seethe Raju , Professor, The University of Sydney, NSW Australia, Ian Smith Head, ACMA Centre for Technology, Pune and Dr. Prantik Ray Professor, XLRI, Jamshedpur, India The next day of the conference saw scintillating talks by Dr. Pallabh Bandyopadhayay Vice President, Human Resources, Citrix R & D India Pvt. 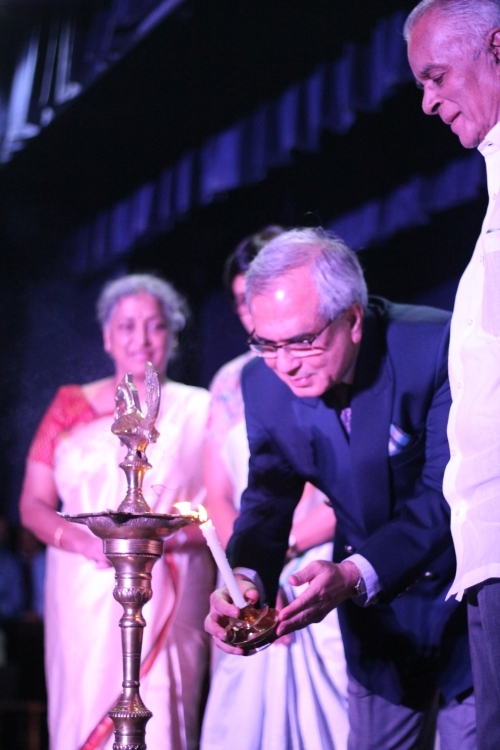 Ltd., Valedictory function was chaired by Dr.Ashok Joshi, Dean Faculty of Management University of Pune. The research papers presented in the conference were also published in Conference Proceedings with an ISBN. 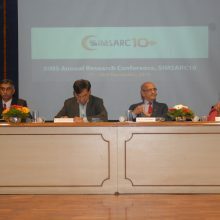 SIMSARC’10 was held on the 17th and 18th of December 2010. 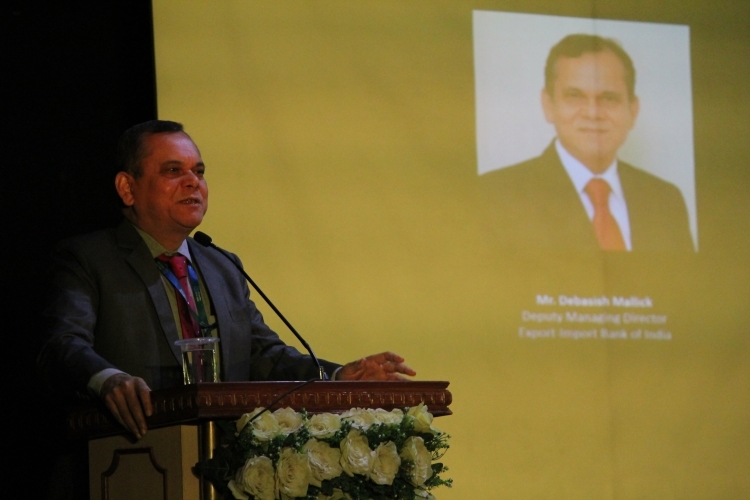 The main theme of the Conference was ‘Myths and Realities of India Advantage: What Needs to be Done to Reach the Potential’ The Conference was inaugurated by Mr. Shashank Inamdar, Vice-Chairman & Co-Founder of Praj Industries who talked about India adopting World Class Standards for reaching the full potential. 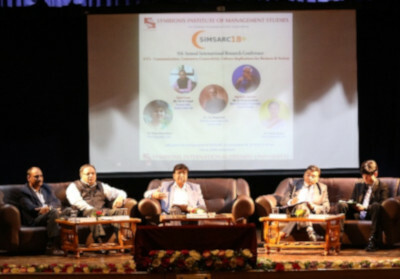 It was then followed by an invigorating discussion on the various aspects of the central theme of the conference by eminent persons like Mr. Bhushan Joshi (CEO, Kenersys, Kalyani Group, Pune), Mr. Rajesh Kamath (Principal Consultant, Learning & Development, Cerebrus Consultants, Pune), and Dr Anuj Paul Gosain ( Strategic Planning Manager, John Deere, IPL, Pune). 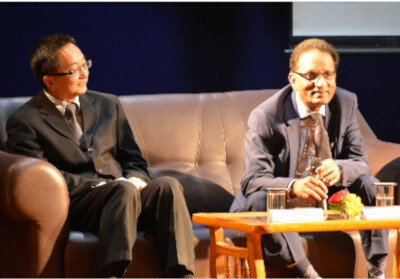 The panel discussion was moderated by eminent academician, Consultant, and Public Nominee Director, Prof Pradeep Apte. The next day of the conference saw scintillating talks by Mr. Abhijeet Ranade (Regional Director, Consultancy, Price Waterhouse Cooper), Dr Ravi Seetham Raju (Professor, Sydney University, Australia), and Mr. Arun Wakhlu (Founder Director, Pragati Leadership Foundation).The Conference received an overwhelming 88 papers from which 52 were short listed and presented. These research papers were also published in Conference Proceedings with an ISBN. Rs.1,500/-per day plus GST 18% will be charged extra. It would be Rs. 1,770 per night.